With Excel 2007 Microsoft introduced a revolutionary new look for the Office Suite applications. The major change was the Ribbon, which completely changed the way we use Excel and other Microsoft Office applications. The major change was the Ribbon, which completely changed the way we use Excel and other Microsoft Office applications. Below, I described different parts of Excel 2013. Please take a look. This is the last “real” toolbar that you can still find in Excel 2013. It’s a place where you can put the most frequently used Excel commands. The Quick Access Toolbar can be located above or below the ribbon. Contrary to the earlier releases, in Excel 2013 Microsoft abandoned the possibility of attaching it to the side of the screen. 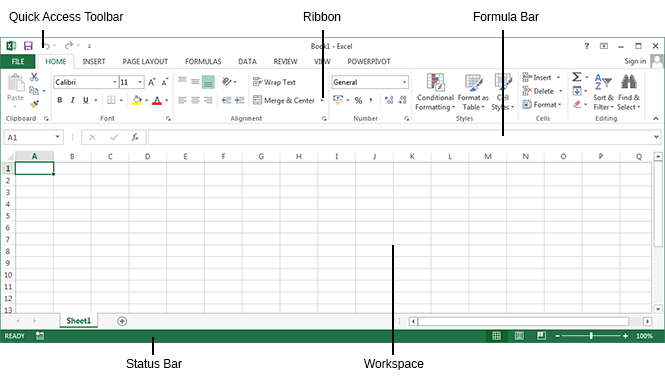 Options in Excel 2003 that were available in the drop-down toolbars have been moved to the ribbon. This allows you to find them easily because they are thematically arranged on the tabs, which are then divided into groups. It’s located below the ribbon. In the formula bar, you can find the content of the currently selected cell. You can also enter and edit data inside the formula bar. The working area is divided into cells, rows, and columns. The address of the cell is determined by the row and column where it is located. For example, if a cell is placed in column K and row 5, the address of the cell is K5. The status bar informs you about the current state of the worksheet. Here, you will also find icons that are responsible for zooming the working area.